Viewing topic "MIDI loop compatibility"
I’m new to the whole midi loop thing and trying to figure out what I can use and how. I’ve found that there are lots of resources out there for midi loops for sale, as well as for free, but there seems to be all sorts of formats. What I’m trying to figure out is what formats are compatible with the XF. And then how I would go about incorporating those into the keyboard. I see that some sites say they are compatible with Steinberg. Does that mean I have to open them in Cubase AI and then do something to make them work in the XF? If the loops are WAV format, does that mean I have to load those wav files only my flash memory? Should I be contacting the seller about these compatibility questions instead? If so, what question(s) should I ask? The reason I’m investigating this is I’m just getting started writing some hard rock stuff. The stuff on the XF is great but there isn’t enough there to keep the songs from sounding similar after a while. So trying to figure out how to find new material. I’m a pianist, never played drums or guitar, so very unsure of how to create or write my own arps for those instruments. Seems like it’s a big time saver in the end if I can just buy from someone else who has already done the hard work. A true MIDI loop has a .MID file extension, and would contain note-on/off data and possibly other MIDI commands. It might be an SMF (Standard MIDI File), and could have GM (General MIDI) mapping. Such a loop can be loaded into a Song location, play the XF Voices, and be remapped if need be. A .WAV file is not a MIDI loop, it’s a type of audio recording. Such loops can be loaded to sample memory, if they’re compatible with the XF (16-bit 44.1kHz maximum). They will sound like whatever was used to create them. 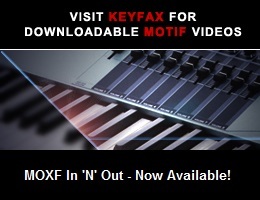 Yes, I’ve looked a lot through what is offered on motifator/Keyfax, thinking those were my only options. Boy, was I delighted to find there is a whole world of midi drum producers out there! I would gladly purchase from here, and have bought a lot of the training videos, and some voices. The issue I have with the stuff from like twiddly bits is that it comes with such a wide range of styles, most of which I have no interest in using. And because there is such a huge amount offered in their stuff, the price is naturally higher. So if I find products very specific to what I’m looking for, at a lower cost, I’m going to definitely go that route. I have found some GM files I’m interested in. Can you help me understand more about what you said about remapping them if need be? So I know if I’m getting in over my head and will look for just .mid files! Thanks again! Your help and guidance is greatly appreciated and will save me tons of time and money! [...] I have found some GM files I’m interested in. Can you help me understand more about what you said about remapping them if need be? So I know if I’m getting in over my head and will look for just .mid files! ...describes how a GM file is constructed. The information can be useful in eliminating the GM Reset command from a file if it’s unwanted, and in remapping sounds to Banks and Voices other than GM ones, using Bank Select and Program Change messages. Sounds like a lot of work to deal with the other formats. I may end up just going what I know will work in the end. Thanks again! The Twiddly.Bits MIDI Sample loop libraries come in a variety of formats that can be loaded directly on the Motif XF (to the Pattern sequence; looped, voiced etc, which can be altered by yourself in due course, if you want) plus Standard MIDI File for loading into a DAW. All formats come in the download so you don’t need to worry about buying the right package. We recently revised our pricing, you might be interested to hear, so check out the titles and specials we have here in the shop. You’re right in that the collections generally have a lot of content but many are style-specific (jazz, reggae, Latin, Colombian, Brazilian, Hip Hop, Dubstep etc.) so, depending on what you’re after there shouldn’t be too much wastage. And with lower pricing hopefully any wastage at all can be viewed as a discovery opportunity! It’s not hard to tweak GM files once you understand the header portion where all the GM commands are located. What sort of styles are you looking for and are you looking for loops other than drums or not? I would love to learn what you’re referring to. I’m looking for anything applicable to rock styles. Working with hard rock stuff right now, but not totally limited to that. Anything in bass or guitar would be helpful too. I figured out I can take the arps that are already in the motif and edit them by recording them in a song or pattern then edit them there and create a new arp. Excited to have the time to mess with that. I have very limited funds to purchase loops so any help I can get learning how to use various sources will be greatly appreciated. How good, or true to its originally created state an SMF will sound can depend a lot on the header information. The header can exert control over the mix, effects, and even sound editing parameters in order to minimize inherent differences between one soundset and another. There is no standard set of data that you have to put in a header (indeed such data can also be placed in a spare ‘set-up’ bar in the body of the file itself) but generally speaking the more information you provide for the receiving sound device the more defined – and so, presumably, the more to your tastes – the results will be. Depending upon the application you are using to create the file in the first place, header information may automatically be saved from within parameters set in the application, or may need to be manually placed in a ‘set-up’ bar before the music data commences. If you are inputting header data yourself it is advisable not to clump all such information together but rather space it out in intervals of 5-10 ticks. Certainly if a file is designed to be looped, having too much data play simultaneously will cause most playback devices to ‘choke, ‘ and throw off your timing. Program change, control change, RPN, NRPN, system exclusive. You need to edit these out or when playing the file your Mixing will be overridden. You can choose to not edit the program changes and let the XF use it’s GM bank or you can edit them to select any XF voices you wish to replace them.